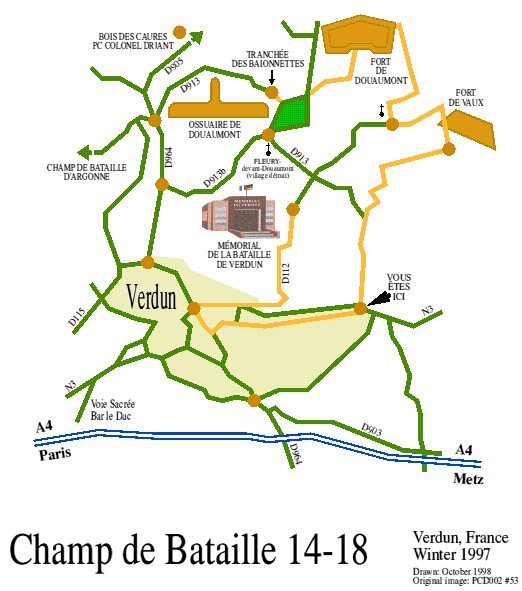 The weather this morning [at Reims] was rather damp (threatening rain, although thankfully this held off until later), so I decided to follow my original plan to go to Verdun and the battlefields surrounding it. After breakfast and fortified for the day ahead, I left the hotel and set off eastwards; the cross-country roads took a more direct route than the autoroute, so I decided to go that way. There was a small token barricade at the junction leading onto the main N44 road at St.Léonard, but getting past this was no trouble and from then on the roads were remarkably clear. Just a short way further on I left the main road and turned off onto a smaller one, heading almost directly east across flat farmland. This followed the line of an old Roman road, as was obvious by its straightness, but some time later the road turned south towards the crossroads at Suippes and then through Valmy before joining the main N3 road just before Ste.Menehould. After the town the road continued through small towns and villages, following the railway line and various insignificant rivers as the flat land around began to give way to forests and hills. 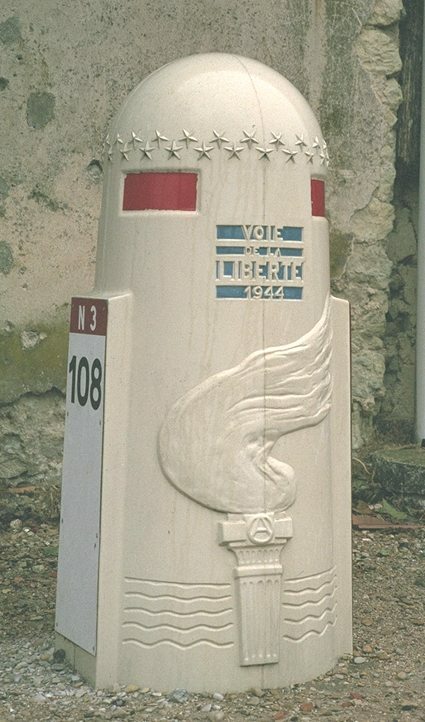 I'd noticed that the road leading south from the next junction, just outside Nixéville, was marked on the map as «Voie Sacrée». Apart from a memorial at the junction, it wasn't obvious why the road was revered in this way, but at the museum later today I would discover that this road had been the main supply route for the French army at the front. However, I didn't turn off this way, but continued just slightly further east into Verdun. Today this is a perfectly normal town, and indeed has an old walled centre and many historic buildings, but its name will always be associated with some of the bitterest fighting of WW I, around the town and along the Meuse valley to the north. My first priority here was to fill up with petrol, having not done so since arriving at Dover two days ago. However, this turned out to be not as simple as might be expected: the major fuel depots throughout the country were one of the truckers' main targets, and by now deliveries were being severely restricted. As a result of this, the first couple of garages that I tried were restricting customers to 100FF worth of petrol each; fortunately there were plenty to choose from, but it was just my luck that the third and last one that I went to (needing only a few more litres to fill the tank) had no such restriction! Having got this out of the way I set off out of the town, initially continuing eastwards towards Etain but soon turning off northwards onto the D913. This is the entrance to the Forêt de Verdun: fairly young as forests go, since it had needed to be completely replanted after four years of fighting had obliterated almost everything which had once existed there, natural and man-made alike. Here there was a notice board with a map showing the main roads and monuments. The present-day German border is some 40 km to the east, but in those days the Alsace region had been ceded to Germany (since 1871); as a result of that, a line of forts had been built to close off this natural route into the interior. So it was not surprising that, from February 1916 through to the end of that year, the Germans tried time and time again to break through the French lines and capture the Meuse valley, the hills along its western side being the last natural obstacle before the flat plains to the west. 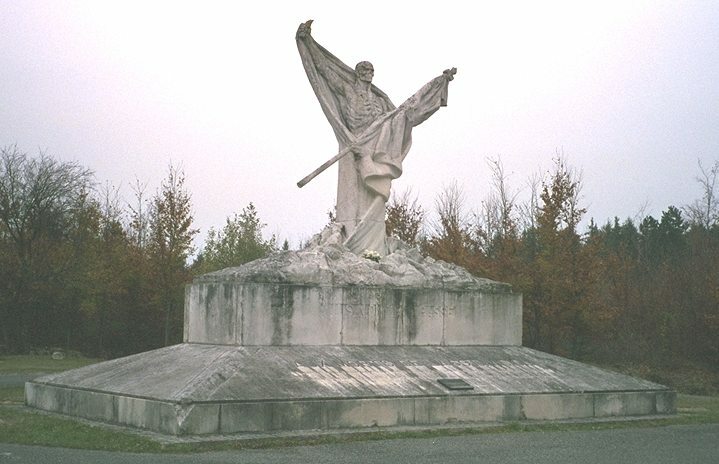 However, the "Great Offensive", like so many of the battles fought along the Allied front here, failed to capture any ground or achieve any decisive results: the line was simply pushed back and forth by first one side then the other, with a total of sixty million shells being fired and half a million killed in those eleven months of fighting. (89K JPEG) The road led into the quiet forest, at first glance no different from any other. But, on looking more closely, the reminders of those days are still here: hidden among the trees just alongside the road was a concrete «Pamard» blockhouse («casemate»), one of a long line of them defending the «Fort de Souville» atop the small hill to the west. Mostly buried below ground level and only just big enough for a few men and some guns (their mountings were still visible through the tiny windows), it must have been a terrifying experience to face the German assault that July, having already been subjected to several months of artillery bombardment and then fire and gas attacks. 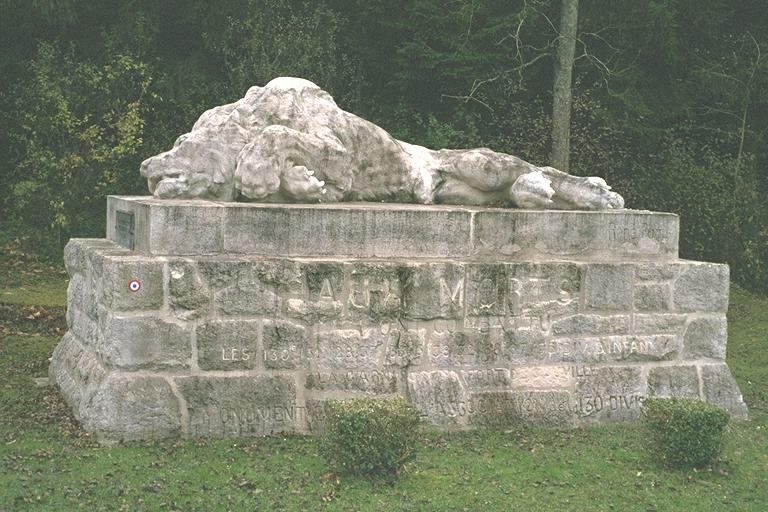 However, the handful of men remaining with their outdated weapons did succeed in stopping the attack; just slightly further to the west, at the junction of the D913 and D112 roads, was the "Wounded Lion" memorial marking the furthest point of the German advance. Von Falkenhayn's army never recovered from being halted there, and never reached the town of Verdun: although they did succeed in crossing the river valley some way to the north, by then it was far too late to take the advantage and their advance westwards effectively ended here. 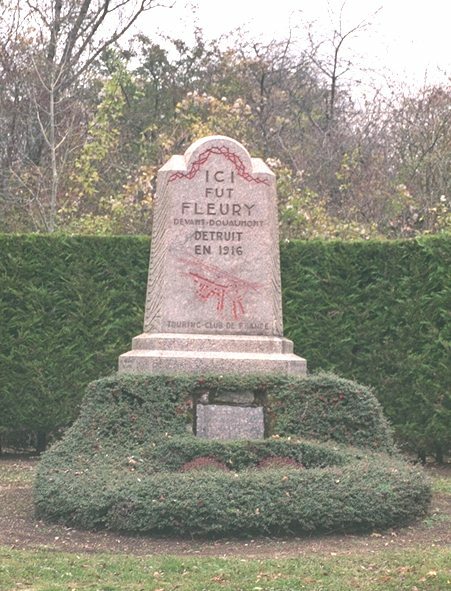 Just past the crossroads I stopped at the «Mémorial de Fleury», now a museum dedicated to those battles and the subsequent reconstruction. Naturally I had to go inside; this was well laid out with the exhibits and photographs on balconies around a scene showing what the "no-man's land" must have been like - battered bare earth (with no trees or any other life remaining), pitted with shell holes and craters, and with the broken remains of buildings, temporary shelters and equipment scattered all around. Around the dimly-lit lower levels, the vehicles and larger exhibits showed how this war had seen the end of the old style of warfare. Initially, both armies had relied heavily on individual men with rifles, backed up with more mobile forces on horseback; those same animals also pulled the guns and the supply carts, the primitive field-kitchens at which the men ate whenever a break in the fighting allowed, and the ambulances which carried the dead and wounded away. Naturally there were aeroplanes: however, these were mainly used for reconnaissance and fire direction, in support of the troops on the ground, rather than with the intent of gaining control in the air. The Germans had then taken the first steps in modern warfare by using directed artillery and machine guns, enabling a small force to meet a larger one on equal terms for the first time. In response to these the French used fixed forts and blockhouses to defend against the barrage of shells, and also developed primitive NBC precautions to counter the gas and flamethrowers, while at the same time the British introduced armoured vehicles to deal with the machine guns and barbed wire. By the end of the war, the foot and horse soldiers were almost obsolete, and the early principles of modern land warfare had been established (most of which are just as valid today). (83K JPEG) Just a short way from the museum, further along the same road, was another graphic reminder of the bitter fighting that had taken place here. The village of Fleury-devant-Douaumont had once been much the same as any other, but it had the misfortune to be caught up in the battle for the town and the river. 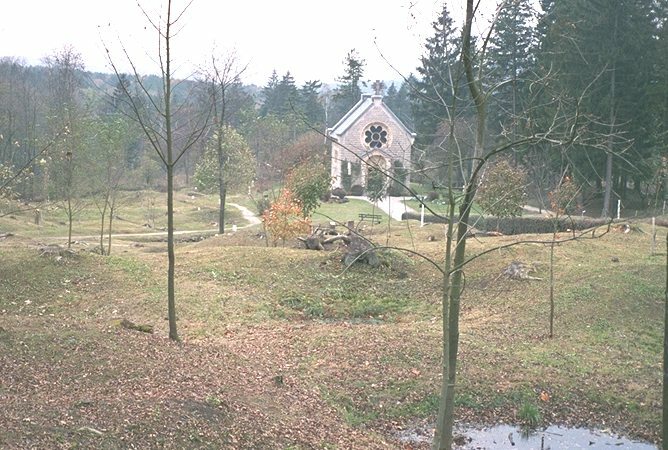 After having been almost totally destroyed in the German artillery bombardment, what remained of the village was bitterly fought over as this ground changed hands sixteen times over the course of that year. All that remains of the village today is a grassy slope leading downwards from the road, with a few stone walls standing. The remainder of the site is still covered with holes and shell craters (now smooth and grass-covered, of course, but recognisable for what they are). Some of the remains of the buildings are marked by plaques; without those there would be no chance of identifying what once stood here, or even that there had been a village at all. The only building still standing was the church (also reconstructed, of course, after the war had ended) where "Our Lady of Europe" watches over the site. It was time to start heading back to the hotel for tonight. There were a number of ways to go from here, but I continued along the same road which turned past the «Ossuaire de Douaumont». As its name implies, this is where the unidentifiable bodies and bones collected from the battlefields now reside - several hundred thousand of them, French, German and many other nationalities all alike. Leading down the hill from the front of the «Ossuaire» were the endless lines of crosses for those that could be identified (but not all by any means: there are some sixty other military cemeteries to be found in the Verdun region alone). In a small area at the head of the field, there was the unusual sight of some Muslim graves - their occupants having obviously followed the call, from some distant colony, to defend their then countrymen's homeland. Their minaret-shaped stones, inscribed in Arabic of course, were turned to face towards Mecca rather than eastwards as did their Christian comrades'. After leaving the «Ossuaire», the road turned westwards and eventually descended to cross the river at Bras-sur-Meuse. There was just one more place to visit, so at Chattancourt I took the white road up to the Mort-Homme hill. This, along with Cote 304 just to the west, was again the scene of bitter fighting between March and May 1916 as the French bravely tried to hold back the Germans after they had succeeded in crossing the river. The attackers did manage to capture the summits of both hills, but were again driven back before they could use the positions to any advantage. Today the hill was deserted; the ground is still marked with demolished buildings and shell craters, with the white stone monument atop the hill overlooking the battleground. ...Ahead, where the low chalk ridges ran across their front, he saw with relief that he had been right, the breeze had not yet dispersed the morning mist that hung in the valleys. The chalk ridges were horribly chewed by shellfire: no vegetation remained on them, the stumps of the shattered oak trees were nowhere as tall as a man's shoulder, and the shell craters overlapped each other, brimming with stagnant water. The ridges had been fought over, month after month, but at the moment were in Allied hands, taken at the beginning of the preceding winter at a cost in human lives that challenged belief. The leprous and pockmarked earth seemed deserted, but it was peopled by the legions of the living and the dead rotting together in the waterlogged earth; the smell of death reached even to the men in the low-flying machines. The villages of Cantin and Aubigny-le-Bac were deserted, shell-shattered skeletons. Only a few stone chimney-pieces had survived the waves of war which had washed back and forth over them; these stuck up like funeral monuments from the muddy torn earth. The two villages were four miles apart; the road that once joined them had been obliterated, and the front lines twisted like a pair of maimed adders through the brown fields between them. The shell holes, filled with stagnant water, blinked up at him like the eyes of the blind. It is hard for us today to imagine what this part of Europe saw and felt in those years of fighting. There are those who say that the entire war was worthless, and that it achieved nothing compared to the cost in terms of lives lost and destroyed; there are others who say that it achieved its immediate purpose but unfortunately prepared the way for an even greater conflict some years later. But what I had seen today had at least given me an insight into the lives and memories of those who fought here eighty years ago, some of whom are still alive today and still find time to remember their fallen comrades. We - present and future generations - should do likewise. (69K JPEG) After descending from the hill I continued westwards, through Varennes-en-Argonne and the woods to its south before rejoining the main road at les Islettes. The milestones (yes, I know that's not the right word!) along this road were in the shape of a shell case, commemorating the Allies' march towards victory in the closing stages of WW II; the exhausted soldiers from the WW I front must have taken much the same route when they were finally able to turn around and head for home. From here I retraced my route of earlier today - there were again a few blockages on the main junctions leading into the city, but nothing particularly serious - and I arrived back at the hotel about teatime for a well-earned rest. So ended my day. The weather had been rather damp, threatening rain all day but fortunately remaining dry for most of the time. Still acceptable for this time of year, although the wind had been rather too strong on the higher ground, east of Verdun and around the «Ossuaire».